By his speech in the Constituent Assembly, Dr.Ambedkar made it clear that he would have nothing to do with any force trying to divide the country on the name of caste, creed or political party. Yet the paradox is that groups who invoke Ambedkar’s “ideology” to promote the very opposite of what he said ! It is sad that even children are not spared in this political game..Watch this video (received over whatsapp) of a small boy stating he is carrying stones to attack the Marathas who have attacked us. He says he has come to Pune inspired by Dr.Ambedkar !! The paradox is that Dr.Ambedkar clearly opposed all forms of anarchy To see small children as tools in a political game is reprehensible. It is not that India was never an independent country. The point is that she once lost the independence she had. Will she lost it a second time? It is this thought which makes me most anxious for the future. What perturbs me greatly is the fact that not only India has once before lost her independence, but she lost it by the infidelity and treachery of some of her own people. In the invasion of Sind by Mahommed-Bin-Kasim, the military commanders of King Dahar accepted bribes from the agents of Mahommed-Bin-Kasim and refused to fight on the side of their King. It was Jaichand who invited Mahommed Gohri to invade India and fight against Prithvi Raj and promised him the help of himself and the Solanki Kings. When Shivaji was fighting for the liberation of Hindus, the other Maratha noblemen and the Rajput Kings were fighting the battle on the side of Moghul Emperors. When the British were trying to destroy the Sikh Rulers, Gulab Singh, their principal commander sat silent and did not help to save the Sikh Kingdom. In 1857, when a large part of India had declared a war of independence against the British, the Sikhs stood and watched the event as silent spectators. Will history repeat itself? It is this thought which fills me with anxiety. This entry was posted in History, Nation and tagged Ambedkar, BhimaKoregaon, Dalits and Marathas, Dalits and Peshwas, Mumbai riots on January 4, 2018 by arisebharat. A Veda Pathashala was threatened to be attacked by a President of a colony in Boduppal , Hyderabad in last week of Nov 2017. The Vedic school received unprecedented support from all quarters. However, some pseudo-Dalit organisations have now blamed #RSS for this and have threatened to launch an agitation against the Veda pathashala, #Samskritam and Sangh invoking the name of Dr.Ambedkar ji. Anyone who has read the Constituent Assembly discussion would know that Dr,#Ambedkar had great respect for Samskritam and supported it as the National Language. He made his own conclusions on when the degeneration of Hindu society started, but at the same time wrote very highly of the Vedic civilization in his complete works calling it egalitarian. He also mentioned about the immense knowledge of Rishikas (women Rishis) during Vedic times thus countering the propaganda that women were not exposed to Vedas. Therefore, it smells of a conspiracy when some people involve his name to attack #Veda and Samskritam. The agenda of some pseudo-Dalit organisations is to drive a wedge in the Hindu society by claiming that Veda is only for a section of society and trying to pit one against the other. I stand in support of Vedic scholars who are putting in their life for upholding Vedic knowledge. This entry was posted in Threats and tagged Ambedkar, Sanskrit, Veda on November 30, 2017 by arisebharat. ….My mind is so full of the future of our country that I feel I ought to take this occasion to give expression to some of my reflections thereon. On 26th January 1950, India will be an independent country (Cheers). What would happen to her independence? Will she maintain her independence or will she lose it again? This is the first thought that comes to my mind. It is not that India was never an independent country. The point is that she once lost the independence she had. Will she lost it a second time? It is this thought which makes me most anxious for the future. What perturbs me greatly is the fact that not only India has once before lost her independence, but she lost it by the infidelity and treachery of some of her own people. In the invasion of Sind by Mahommed-Bin-Kasim, the military commanders of King Dahar accepted bribes from the agents of Mahommed-Bin-Kasim and refused to fight on the side of their King. It was Jaichand who invited Mahommed Gohri to invade India and fight against Prithvi Raj and promised him the help of himself and the Solanki Kings. When Shivaji was fighting for the liberation of Hindus, the other Maratha noblemen and the Rajput Kings were fighting the battle on the side of Moghul Emperors. When the British were trying to destroy the Sikh Rulers, Gulab Singh, their principal commander sat silent and did not help to save the Sikh Kingdom. In 1857, when a large part of India had declared a war of independence against the British, the Sikhs stood and watched the event as silent spectators. On the 26th of January 1950, India would be a democratic country in the sense that India from that day would have a government of the people, by the people and for the people. The same thought comes to my mind. What would happen to her democratic Constitution? Will she be able to maintain it or will she lost it again. This is the second thought that comes to my mind and makes me as anxious as the first. It is not that India did not know what is Democracy. There was a time when India was studded with republics, and even where there were monarchies, they were either elected or limited. They were never absolute. It is not that India did not know Parliaments or Parliamentary Procedure. A study of the Buddhist Bhikshu Sanghas discloses that not only there were Parliaments-for the Sanghas were nothing but Parliaments – but the Sanghas knew and observed all the rules of Parliamentary Procedure known to modern times. They had rules regarding seating arrangements, rules regarding Motions, Resolutions, Quorum, Whip, Counting of Votes, Voting by Ballot, Censure Motion, Regularization, Res Judicata, etc. Although these rules of Parliamentary Procedure were applied by the Buddha to the meetings of the Sanghas, he must have borrowed them from the rules of the Political Assemblies functioning in the country in his time. This democratic system India lost. Will she lost it a second time? I do not know. But it is quite possible in a country like India – where democracy from its long disuse must be regarded as something quite new – there is danger of democracy giving place to dictatorship. It is quite possible for this new born democracy to retain its form but give place to dictatorship in fact. If there is a landslide, the danger of the second possibility becoming actuality is much greater. The third thing we must do is not to be content with mere political democracy. We must make our political democracy a social democracy as well. Political democracy cannot last unless there lies at the base of it social democracy. What does social democracy mean? It means a way of life which recognizes liberty, equality and fraternity as the principles of life. These principles of liberty, equality and fraternity as the principles of life. These principles of liberty, equality and fraternity are not to be treated as separate items in a trinity. They form a union of trinity in the sense that to divorce one from the other is to defeat the very purpose of democracy. Liberty cannot be divorced from equality, equality cannot be divorced from liberty. Nor can liberty and equality be divorced from fraternity. Without equality, liberty would produce the supremacy of the few over the many. Equality without liberty would kill individual initiative. Without fraternity, liberty would produce the supremacy of the few over the many. Equality without liberty would kill individual initiative. Without fraternity, liberty and equality could not become a natural course of things. It would require a constable to enforce them. We must begin by acknowledging the fact that there is complete absence of two things in Indian Society. One of these is equality. On the social plane, we have in India a society based on the principle of graded inequality which we have a society in which there are some who have immense wealth as against many who live in abject poverty. On the 26th of January 1950, we are going to enter into a life of contradictions. In politics we will have equality and in social and economic life we will have inequality. In politics we will be recognizing the principle of one man one vote and one vote one value. In our social and economic life, we shall, by reason of our social and economic structure, continue to deny the principle of one man one value. How long shall we continue to live this life of contradictions? How long shall we continue to deny equality in our social and economic life? If we continue to deny it for long, we will do so only by putting our political democracy in peril. We must remove this contradiction at the earliest possible moment or else those who suffer from inequality will blow up the structure of political democracy which is Assembly has to laboriously built up. The second thing we are wanting in is recognition of the principle of fraternity. what does fraternity mean? Fraternity means a sense of common brotherhood of all Indians-if Indians being one people. It is the principle which gives unity and solidarity to social life. This entry was posted in History, Nation and tagged Ambedkar, Constituent Assembly, Indian Constitution on June 7, 2017 by arisebharat. The recent controversy about a group named “Ambedkar-Periyar Study Circle” being derecognised by the IIT-Madras administration has brought to light the modus-operandi of Leftist groups in academic institutions. One of the ways in which Leftist groups operate is by appropriating the legacy and names of famous icons, even if the stated views of the icons were diametrically opposite to the views held by the Left. E.V.Ramasamy fondly addressed as ‘Periyar’ by his followers was a racist. He believed in racial theories, especially in the Aryan race theory(ies). He promoted racial stereotypes. On the other hand, Dr.Ambedkar was the quintessential humanist. He studied the so-called Aryan race theory and racial interpretation of Indian society and rejected it. E.V.Ramasamy was a pro-monotheistic in the garb of an atheist. He stated : “I am not asking you not to worship God but to worship one God like the way Christians and Muslims do.”(Viduthalai, 04-06-1959) To EVR colonial imperialism was the ultimate sign of a religion’s superiority. “To support Democracy because we are all children of God is a very weak foundation for Democracy to rest on. That is why Democracy is so shaky wherever it made to rest on such a foundation. But to recognize and realize that you and I are parts of the same cosmic principle leaves room for no other theory of associated life except democracy. It does not merely preach Democracy. It makes democracy an obligation of one and all. 3. E.V. Ramasamy Was No Democrat. Ambedkar Was. E.V.R was basically anti-Indian. He never considered India as a unified entity. He was for linguistic and racial balkanisation of India. Dr.Ambekdar was deeply convinced of the basic cultural unity of India and the need for the political unification of India based on that spiritual-cultural basis. Dr.Ambedkar definitively rejected the linguistic basis of the nation-state. “Aryans were nomads in different places and picked up different dialects. And what they call today their Sanskrit language is actually a combination of these dialects and languages spoken at different places in different ages. The Sanskrit language has nothing noble in it and the Brahmins spoke high about Sanskrit only to make themselves superior and to humiliate other languages.” (From the collection “The Great Falsehood”, Viduthalai, 31-July-2014). Dr.Ambedkar, on the other hand, was sympathetic to the Jews. He supported Israel and never showed any hatred towards Brahmins. Far from that his respect for humanists cut across such caste and creed lines so much so that when he started the Siddharth College, Bombay, – the first college established by Peoples Education Society, he requested Professor Ashwathamacharya Balacharya Gajendragadkar to become the first principal. Gakedragadkar who was then in Elphinstone College, Bombay, took early retirement and accepted the offer. Such a vision cannot be seen in EVR whose ‘social action’ was limited to racist rhetoric and seldom anything more. Even while calling for the destruction of Smrithi and Sruthi based religion Dr.Ambedkar also specifically stated that Hindus should adapt their religion to modern situation transforming it into a religion of liberty, equality and fraternity based on the principles present in Upanishads. He always considered these important values as having Indic rather than European roots. 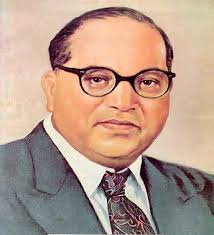 Thus in his ‘Annihilation of Caste’, Dr.Ambedkar stated: “… for such religious principles as will be in consonance with Liberty, Equality and Fraternity, it may not be necessary for you to borrow from foreign sources, and that you could draw for such principles on the Upanishads.” Later in his ‘Riddles‘ he elaborated how the Mahavakyas can form the spiritual basis for social democracy. Again such an in-depth analysis and rootedness is conspicuously wanting in E.V.R. Given the fact that the majority of those killed could be labelled ‘upper caste’ Hindus, Dr.Ambedkar could have easily ‘justified’ the riots like the modern day Leftists. But he chose to do otherwise. Now let us compare a similar incident in the life of EVR. During the DMK regime, 44 Dalits were massacred at Keezhvenmani – a village in Tamil Nadu. They were burnt to death by non-Brahmin ‘Dravidian’ upper castes. EVR never condemned the massacre of Dalits by non-Brahmin caste ‘Dravidians’ and in a display of unrestricted perversion condemned those who organized the Dalits to fight for the higher wages. This entry was posted in History, Nation and tagged Ambedkar, Dr.BR Ambedkar, E.V.Ramaswamy, Periyar, Ramaswamy Naikar on June 7, 2017 by arisebharat.